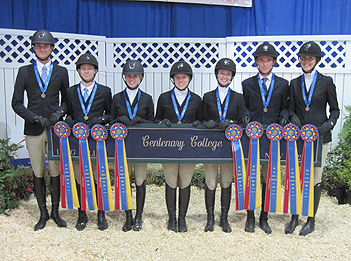 Cody Wooton (on far left) won a pair of team intermediate classes while Kathryn Haley (third on left) earned a second and a fourth in the open divisions to help lift Centenary College to High Point Hunter Seat Team honors at 2014 IHSA Nationals in Harrisburg, Pennsylvania. HARRISBURG, PA - The hunter seat team with the longest run of Region Titles in IHSA is Centenary College. The Cyclones have won their region every season since earning top honors during the 1989-90 season. This makes for 25 consecutive region titles and counting. The Ohio State University western team has an even longer run. The Buckeyes were western region champions during the 1986-87 season and every year since. This gives Ohio State a run of 28 straight. 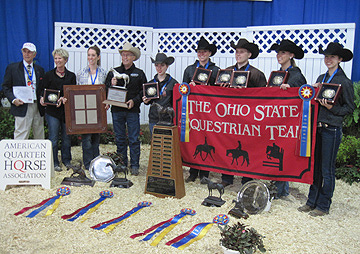 Both schools survived the post season (with Ohio State getting a bit of a scare at the Canyon, Texas Semifinal, placing third behind defending National Champion and host West Texas A & M University and the University of Wisconsin at River Falls) to field full teams at IHSA Nationals May 1st through 4th at the Pennsylvania Farm Show Complex in Harrisburg, Pennsylvania. When the dust settled both Centenary and Ohio State were the new National Champions in their respective disciplines, with Centenary earning their third title since 2009 and Ohio State their first since 2008. Centenary won the second, third and fourth hunter seat team classes to take a lead they would not relinquish. Cody Wooten, a sophomore from Eldersburg, Maryland, won both team intermediate flat and team intermediate fences bridging the afternoon of May 1st and the morning of May 2nd to bring Centenary's total to 21 points at the time. Caroline Norton had already won team novice flat while Kathryn Haley would score eight points over both the May 3rd open classes. When it was over Centenary had earned a 31-24 win over the College of Charleston. The Cougars were led by Victoria Bauer, who won the first team class (novice fences) and Victoria Gonzalez, who won the team walk-trot division. Open rider Eliza Hay scored eight points with a pair of thirds on May 3rd to insure Charleston finished one point ahead of defending co-National Champion Skidmore College. The Thoroughbreds scored 23 points which was actually one more point than their 22 total a year earlier which had been good enough for a tie with St. Lawrence University at the time. Both Savannah College of Art & Design and Delaware Valley College scored 21 points to tie for fourth while defending co-champion St. Lawrence was the only other school into double figures with 11 points. Ohio State University has won IHSA Western National Championships in 1991, '92, '93, '96, '97, '99, '02 (shared), '06, '08 and now 2014. The Buckeyes are the first IHSA program - Western or English - to reach double digits in team titles at Nationals. While Centenary won for the third time in six tries and the fifth time in program history, Ohio State ended their longest drought since they won their first title in 1991. The Buckeyes had won or shared first place nine times between 1991 and 2008. Ohio State is now the first IHSA program ever - English or Western - to have won ten team National Championships. The Buckeyes were in a very close race with Findlay throughout the event with the Oilers ahead some of the time. Austin Griffith was his usual self, winning team open reining (with a score of 146.5) while placing second to Julia Roberts of West Texas A & M in team open western. In between the Buckeyes earned points in every division, with Michelle LeMaster winning team intermediate western before Griffith's second in western horsemanship put them on top by a 29-25 total. Findlay was led by Sarah Shedd, who won team novice western and Marissa Phillips, who won advanced western early in the day on May 4th. The Oilers finished a point ahead of St. Andrews, which was led by team beginner western horsemanship winner Austin Trockenbrot. Both Berry College and the University of Nebraska at Lincoln were also into double figures with 18 points each. The individual AQHA high point open rider division featured the closest race of all time! Both Griffith and Roberts had the exact same combined score through both phases, with Griffith having faired better during the reining phase and Roberts the leader in horsemanship. There was no ride-off but rather the score of the flat judge was used to break the tie. Though Griffith was in line to win a third consecutive individual AQHA high point open rider award the tiebreaker went to Roberts, making her the first West Texas A & M rider ever to win the award. Roberts won three classes over the course of two days as the senior from Clovis, New Mexico also won the NRHA-sponsored individual open reining, assuring her a place at the Derby in Oklahoma City next month. Alex Carlton of the University of Vermont (on horse) was leading the Cacchione Cup competition through the over fences phase (with a score of '86') before landing in third place through the flat phase. However when the top five were tested Carlton moved back into first and claimed the 2014 Cacchione Cup. 38 riders took part in the Cacchione Cup competition. 24 made it through the over fences phase and five were called back for the work-off. University of Vermont sophomore Alex Carlton, who led the Cacchione through the jumping phase went on to win. From Madison, Connecticut Carlton edged out Emily D'Alessandro of St. Lawrence University, who had been third in the over fences. Haley of Centenary was third followed by Michael Kocher of Savannah College of Art & Design in fourth and Blake Roberts of Virginia Intermont College in fifth. Roberts moved up significantly in the flat phase, having been ninth through the over fences. Carlton is the second - ever University of Vermont rider to win the cup, as John Pigott did so as well at 2003 Nationals. The complete placings from 2014 IHSA Nationals follow. It should be noted that several phases of the Cacchione and individual AQHA took place in some cases a day before the actual ribbons were announced. The results of these classes are listed in the order at which time the ribbons were announced. 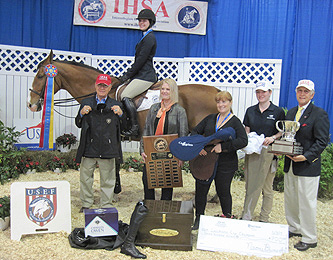 The 2014 IHSA Nationals Class-by-Class Results, held at the Pennsylvania Farm Show Complex in Harrisburg, Pennsylvania May 1st through 4th. The The Classes are listed in the order in which they were held. The hunter Seat Judges were Scott Hoffstetter and Mike Rosser while the Western Judges were Lynn Palm and Bob Kail. Individual Intermediate Equitation Over Fences: 1. Mackenzie Alderman, St. Lawrence University. 2. Sarah Hibler, Sweet Briar College. 3. Ashleigh Ramey, Virginia Intermont College. 4. Kayla Bean, Otterbein University. 5. Tyler Linde, Centenary College. 6. Taylor Shekels, University of Florida. 7. Katie Kirwin, Bates College. 8. Nell Maynard, Mount Holyoke College. 9. Alexa Prettyman, University of Kentucky. 10. Kaitlin Smith, Cornell University. Individual Open Equitation Over Fences: 1. Felicia Harrsch, Mount Holyoke College. 2. Blake Roberts, Virginia Intermont College. 3. Michael Kocher, Savannah College of Art & Design. 4. Kathryn Haley, Centenary College. 5. Kabisa Baughen, Brown University. 6. Joey Fink, Goucher College. 7. Chelsea Huss, Cornell University. 8. Emily Steeley, University of Minnesota at Crookston. 9. Rebekah Scharfe, Lafayette College. 10. Claire Margolis, Stanford University. Individual Novice Equitation Over Fences: 1. Deanna Zajic, Centenary College. 2. Kendall Jones, University of Florida. 3. Kayleigh McDonnell, Stonehill College. 4. Lynne Kubik, Illinois State University. 5. Kristen Bailey, University of Richmond. 6. Katherine Snyder, Delaware Valley College. 7. Alex Catalino, State University of New York at Geneseo. 8. Mackenzie Majeskie, Otterbein University. 9. Hannah Kiesler, Bates College. 10. Amelia Nowicki, University of Georgia. Team Novice Equitation Over Fences: 1. Tori Bauer, College of Charleston. 2. Allie Bienas, Delaware Valley College. 3. Meredith Denny, Savannah College of Art & Design. 4. Meaghan Haugh, Dartmouth College. 5. Anna Carmichael, Goucher College. 6. Genevieve Couldwell, Mount Holyoke College. 7. Caitlyn Woychik, St. Andrews University. 8. Rachel McDonnell, Miami University of Ohio. 9. Dakota Quelland, University of Findlay. 10. Caroline Norton, Centenary College. Individual Intermediate Equitation On The Flat: 1. Mariele Chambers, Gettysburg College. 2. Cory Cochran, University of Southern California. 3. Meaghan Hynes, Randolph College. 4. Katie Wifvat, University of Minnesota - Twin Cities. 5. Holly Frick, East Carolina University. 6. Jen Mickley, Bloomsburg University. 7. Kira Skaggs, Amherst College. 8. Allison Pelzel, Colorado School of Mines. 9. Maggie Zinkel, University of Michigan. 10. Charlotte Tate, Miami University of Ohio. Individual Novice Equitation On The Flat: 1. Reynolds Martin, Randolph College. 2. Dominique Marcynyszyn, Cal Poly - Pomona. 3. Madeline Shortt, Mount Holyoke College. 4. Jessica Stoukides, Skidmore College. 5. Holly Grench, Stanford University. 6. Autumn Allaire, University of Kentucky. 7. Renee Russo, Delaware Valley College. 8. Katie Pohlman, University of Findlay. 9. Katie Drake, Sweet Briar College. 10. Chelsea Cotton, Curry College. Team Novice Equitation On The Flat: 1. Caroline Norton, Centenary College. 2. Abbie Gibson, Skidmore College. 3. Quinn Lowsky, Savannah College of Art & Design. 4. Olivia Gardner, Delaware Valley College. 5. Jessica Murray, Mount Holyoke College. 6. Jenna Kolb, Purdue University. 7. Jordyn Clarke, Oregon State University. 8. Meaghan Haugh, Dartmouth College. 9. Anna Carmichael, Goucher College. 10. Katherine Figueroa, St. Lawrence University. Individual Walk-Trot-Canter Equitation On The Flat: 1. Reanna Wall, Virginia Tech. 2. Tayler Rohling, Cazenovia College. 3. Sara Tillman, Berry College. 4. Jess Berman, Cazenovia College. 5. Karlee Burmaster, University of New Hampshire. 6. Rachel Gackstetter, University of California at Davis. 7. Sarah Jacobson, Stanford University. 8. Melissa Colby, Truman State University. 9. Libby Danforth, Indiana University. 10. Callan Donovan, Dickinson College. Individual Open Equitation On The Flat: 1. Emily D'Alessandro, St. Lawrence University. 2. Sarah Kieran, University of Massachusetts at Dartmouth. 3. Claire Margolis, Stanford University. 4. Taylor Rose, Bridgewater College. 5. Joey Fink, Goucher College. 6. Rebekah Scharfe, Lafayette College. 7. Lauren Powers, Penn State University (State College). 8. Rachel Anderson, University of Montana. 9. Laura Hinsdale, University of Vermont. 10. Georgiana de Rham, Cornell University. Team Intermediate Equitation On The Flat: 1. Cody Wooton, Centenary College. 2. Alyssa Bokor, St. Lawrence University. 3. Ryan Genn, Savannah College of Art & Design. 4. Samantha Butti, Delaware Valley College. 5. Heather Zadra, Mount Holyoke College. 6. Jessica Stoukides, Skidmore College. 7. Cami Glaff, St. Andrews University. 8. Devon MacNeil, Stanford University. 9. Melissa McDonald, University of Findlay. 10. Molly Schlagel, Purdue University. Alumni Equitation Over Fences: 1. Kristen Cox, University of Washington. 2. Natasha Klingenstein, Centenary College. 3. Jessica Fontanelli, Syracuse University. 4. Kristen Marley, Virginia Tech. 5. Tara Donohue, Stony Brook University. 6. Alexandra Kemp - Thompson, Seton Hill University. 7. Stephanie Cook, United States Military Academy. 8. Sara McCoy Palmer, University of Delaware. 9. Erin Sutherland, Northern Illinois University. 10. Alaina Floyd, Clemson University. Team Intermediate Equitation Over Fences: 1. Cody Wooton, Centenary College. 2. Jessica Stoukides, Skidmore College. 3. Jessie Lewis, St. Lawrence University. 4. Molly Schlagel, Purdue University. 5. Trudy Noll, College of Charleston. 6. Lindsay Seewald, Dartmouth College. 7. Devon MacNeil, Stanford University. 8. Lauren Martin, University of Findlay. 9. Alexandra Roe, Miami University of Ohio. 10. Renee Russo, Delaware Valley College. Team Open Reining: 1. Austin Griffith, Ohio State University. 2. Kallie Kayton, University of Nebraska at Lincoln. 3. Michelle Hustad, St. Andrews University. 4. Andrea Smith, Berry College. 5. Josh Clevenger, University of Findlay. 6. Alie Leonhart, University of Wisconsin at River Falls. 7. Rebekah Strunk, Clemson University. 8. Kendra Clarke, Delaware Valley College. Individual Open Western Horsemanship: 1. Kaitlin LeBlanc, University of Findlay. 2. Ariel Herrin, Middle Tennessee State University. 3. Emily Dean, Purdue University. 4. Michelle Hustad, St Andrews University. 5. Austin Griffith, Ohio State University. 6. Rebekah Strunk, Clemson University. 7. Elissa Benning, Ohio State University. 8. Elizabeth Poczobut, Berry College. 9. Allison Board, University of Kentucky. 10. Kodi Anderson, North Central Texas College. Alumni Western Horsemanship: 1. Allison Erkman, University of Tennessee at Knoxville. 2. Megan Carter, University of Kentucky. 3. Jenny Imlay, Michigan State University. 4. Lea Hoover, Oregon State University. 5. Laura Karrer, Midway College. 6. Sarah Todak, Ohio University. 7. Michelle Ivan, Saginaw Valley State University. 8. Rebecca Folk, Lafayette College. Individual Walk-Trot Equitation On The Flat: 1. Emma Zamierowski, Stonehill College. 2. Holly Attuso, Louisiana State University. 3. Erin Pesa, Ohio State University. 4. Katie Knutson, Mount Holyoke College. 5. Garret Wells, University of Tennessee at Knoxville. 6. Alex Vinson, United States Military Academy. 7. Rachel LeRoy, Berry College. 8. Jasmine Wehr, University of Findlay. 9. Tomara Bodnaruik, Morrisville State College. 10. Sarah Villasenor, Sonoma State University. Team Walk-Trot Equitation On The Flat: 1. Victoria Gonzalez, College of Charleston. 2. Kylie Fleming, Miami University of Ohio. 3. Cecilia Langley, Savannah College of Art & Design. 4. Sarah Lindsay, Stanford University. 5. Brandon Tammone, Centenary College. 6. Jake Hobson, St. Andrews University. 7. Manon Edeline, St. Lawrence University. 8. Caroline Montgomery, Skidmore College. 9. Kaili Janette, Goucher College. 10. Regan Abromitis, Delaware Valley College. Team Walk-Trot-Canter Equitation On The Flat: 1. Jessica Story, St. Andrews University. 2. Tori Smolinski, Savannah College of Art & Design. 3. Lauren Kuong, Skidmore College. 4. Melissa Eaton, Delaware Valley College. 5. Jaclyn Azelby, Mount Holyoke College. 6. Sydney Carpenter, University of Wisconsin at Madison. 7. Sarah Lummis, Goucher College. 8. Meg Rauner, Dartmouth College. 9. Victoria Greenen, Stanford University. 10. Sheherazode Scott - Schultz, University of Findlay. Team Novice Western Horsemanship: 1. Sarah Shedd, University of Findlay. 2. Lidia Pedrozo, Ohio State University. 3. Logan Teeter, St. Andrews University. 4. Kayla Mack, University of Wisconsin at River Falls. 5. Ethan Callahan, University of Nebraska at Lincoln. 6. Samantha Brown, Berry College. 7. Megan Pirtle, West Texas A & M University. 8. Allyssa Priester, Clemson University. 9. Megan Lee, Delaware Valley College. Team Open Equitation Over Fences: 1. Chelsea Koerper, Delaware Valley College. 2. Kathryn Haley, Centenary College. 3. Eliza Hay, College of Charleston. 4. Ursula Green, Skidmore College. 5. Darby Dyar, Purdue University. 6. Kristie Hohol, University of Wisconsin at Madison. 7. Claire Margolis, Stanford University. 8. Jackie Yeager, Miami University of Ohio. 9. Kelsey Kocher, St. Andrews University. 10. Taylor VanderZanden, Oregon State University. Cacchione Cup Competition: 1. Alex Carlton, University of Vermont. 2. Emily D'Alessandro, St. Lawrence University. 3. Kathryn Haley, Centenary College. 4. Michael Kocher, Savannah College of Art & Design. 5. Blake Roberts, Virginia Intermont College. 6. Georgiana de Rham, Cornell University. 7. Madeline Reich, Middle Tennessee State University. 8. Claire Margolis, Stanford University. 9. Olivia Smith, Sweet Briar College. 10. Chelsea Koerper, Delaware Valley College. 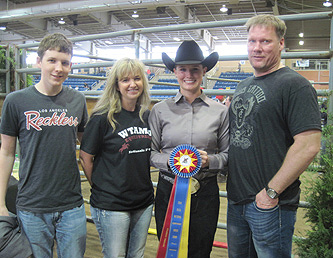 From Clovis, New Mexico, West Texas A & M University senior Julia Roberts (second on right, with her family) won three classes at 2014 IHSA Nationals: Individual open reining, team open western horsemanship and most notably the individual AQHA High Point Open Rider competition. Perhaps for the first time ever a tiebreaker was needed to determine the new 'best open western rider in the IHSA for the season' and Roberts won that tiebreaker. National Reining Horse Association Individual Open Reining: 1. Julia Roberts, West Texas A & M University. 2. Ashley Winters, University of Findlay. 3. Austin Griffith, Ohio State University. 4. Leah DiGioia, State University of New York at Cobleskill. 5. Emily Honey, Oregon State University. 6. Kodi Anderson, North Central Texas College. 7. McKenna Coveney, Cal Poly - Pomona. 8. Derek Partridge, Alfred University. 9. Catherine Jula, West Virginia University. 10. Rebekah Strunk, Clemson University. Team Open Equitation On The Flat: 1. Joey Fink, Goucher College. 2. Ursula Green, Skidmore College. 3. Eliza Hay, College of Charleston. 4. Kathryn Haley, Centenary College. 5. Emily D'Alessandro, St. Lawrence University. 6. Bridget Finnerty, Mount Holyoke College. 7. Allison Drost, Miami University of Ohio. 8. Claire Margolis, Stanford University. 9. Kelsey Kocher, St. Andrews University. 10. Jessica Katz, Delaware Valley College. Alumni Equitation On The Flat: 1. Allison Schaitman, Mount Ida College. 2. Courtney Newby, Lake Erie College. 3. Tara Donohue, Stony Brook University. 4. Julianne Kime, High Point University. 5. Kristen Cox, University of Washington. 6. Haleigh Boswell, Penn State University (State College). 7. Soraya Issa, Oregon State University. 8. Natalee Rolince, Springfield College. 9. Hilary Distler, St. Mary of the Woods College. 10. Kristen Marley, Virginia Tech. Team Beginner Western Horsemanship: 1. Austin Trockenbrot, St. Andrews University. 2. Mackenzie Eickhoff, Berry College. 3. Lindsay Testerman, University of Findlay. 4. Caitlyn Loeffler, Ohio State University. 5. Cana Fitzgerald, West Texas A & M University. 6. Lauren Welch, University of Nebraska at Lincoln. 7. Elizabeth Kieffer, University of Wisconsin at River Falls. 8. Derek Foltz, Clemson University. 9. Alyssa Riggins, Delaware Valley College. Alumni Reining: 1. Megan Carter, University of Kentucky. 2. Mary Forster, Miami University of Ohio. 3. Lea Hoover, Oregon State University. 4. Alexis Plavocos, Bucks County Community College. 5. Michelle Ivan, Saginaw Valley State University. 6. Kimberly King, University of Tennesee at Knoxville. 7. Allison Erkman, University of Tennessee at Knoxville. 8. Jennifer Taylor, Arcadia University. Team Advanced Western Horsemanship: 1. Marissa Phillips, University of Findlay. 2. Cecilia Shields - Auble, Berry College. 3. Blake Preston, University of Nebraska at Lincoln. 4. Mark Mowbray, St. Andrews University. 5. Ciara Bartholomew, Ohio State University. 6. Markie Maletzke, University of Wisconsin at River Falls. 7. Kinzee Shull, West Texas A & M University. 8. Shealy Melton, Clemson University. 9. Maria Pistone, Delaware Valley College. Team Intermediate Western Horsemanship: 1. Michelle LeMaster, Ohio State University. 2. Laura Bailey, University of Findlay. 3. Kellsie Knolin, Berry College. 4. Molly Gruener, University of Nebraska at Lincoln. 5. Dugan McDermott, St. Andrews University. 6. Mary Taylor, Delaware Valley College. 7. Kimberly Newkirk, West Texas A & M University. 8. Chloe Iverson, Clemson University. 9. Hannah Symbal, University of Wisconsin at River Falls. Individual Advanced Western Horsemanship: 1. Kayla Wells, West Texas A & M University. 2. Janna Rice, North Dakota State University. 3. Mackenna Phelps, University of Connecticut. 4. Bailey Forester, Northeastern Oklahoma A & M College. 5. Elizabeth Ellis, Berry College. 6. Katelynn Greenawald, Slippery Rock University. 7. Sarah New, St. Mary of the Woods College. 8. Tessa Lopez, West Texas A & M University. 9. Elizabeth Deese, North Carolina State University. 10. Michelle McDowell, Grand Valley State University. Individual Intermediate Western Horsemanship: 1. Rebekah Thomson, Rocky Mountain College. 2. Tatum Albano, North Carolina State University. 3. Brook Grobosky, University of Arizona. 4. Erin Hudson, St. Andrews University. 5. Roxanne Raye, Cal Poly - San Luis Obispo. 6. Allie Buccos, Sacred Heart University. 7. Megan Lee, Delaware Valley College. 8. Mary Staub, Black Hawk College. 9. Jamie Mueller, Black Hawk College. 10. Samantha Kershner, Miami University of Ohio. Individual AQHA High Point Open Rider Competition: 1. Julia Roberts, West Texas A & M University. 2. Austin Griffith, Ohio State University. 3. Michelle Hustad, St. Andrews University. 4. Andrea Smith, Berry College. 5. Samantha Kirby, State University of New York at Oswego. 6. Allie Leonhart, University of Wisconsin at River Falls. 7. Katrina Quick, University of Nebraska at Lincoln. 8. Morgan Sykes, University of Central Florida. 9. Josh Clevenger, University of Findlay. 10. Emily Honey, Oregon State University. Individual Beginner Western Horsemanship: 1. Hailey Aagard, North Dakota State University. 2. Rachel Foster, West Texas A & M University. 3. Emily Schaefer, University of Findlay. 4. Jamie Deans, Redlands Community College. 5. Isadora Bevan, State University of New York at Oswego. 6. Victoria Wiese, St. Andrews University. 7. Jolie Fu, Mount Holyoke College. 8. Daniel Moltion, State University of New York at Oswego. 9. Mackenzie Reuss, Lander University. 10. Gabrielle Schuler, Black Hawk College. Team Open Western Horsemanship: 1. Julia Roberts, West Texas A & M University. 2. Austin Griffith, Ohio State University. 3. Michelle Hustad, St. Andrews University. 4. Katrina Quick, University of Nebraska at Lincoln. 5. Kayla Gosz, University of Wisconsin at River Falls. 6. Rebekah Strunk, Clemson University. 7. Andrea Smith, Berry College. 8. Melissa McDonald, University of Findlay. 9. Bailey Young, Delaware Valley College. Individual Novice Western Horsemanship: 1. Rebecca Harder, State University of New York at Oswego. 2. Kristina Schneider, University of Findlay. 3. Marion Quattlebaum, North Carolina State University. 4. Maria Pistone, Delaware Valley College. 5. Jessica Moore, Middle Tennessee State University. 6. Caitlin Johnson, Western Washington University. 7. Stephanie Norton, University of Arizona. 8. Angela Bradley, West Texas A & M University. 9. Fallon Jackson, University of Kentucky. 10. Shannon Salm, University of Minnesota at Crookston.